Posted on April 17th, 2014 in Retail PR,Shopping Centre PR Stunts,Stunt Of The Day. 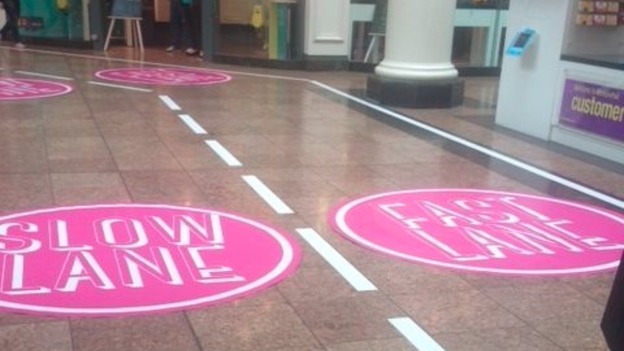 The Meadowhall shopping centre in Sheffield has begun a trial for a new overtaking lane for shoppers today – reports ITV News. 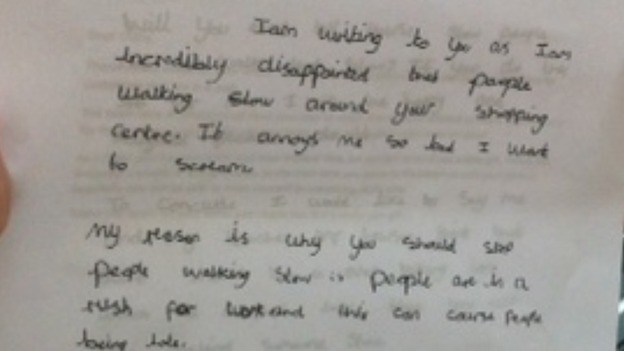 The primary school pupil then went on to propose an over-taking lane so people could pick their own pace. Activating ideas around customer suggestion letters has proved a successful PR fodder in recent years. Especially when the ideas put forward have been generated by adorable children. Sainsbury’s famously renamed tiger bread to giraffe bread after a complaint letter from a 3-year-old and York Railway museum created a dream job for six-year-old Sam Pointon who wrote to the museum and applied to replace retiring director Andrew Scott. Kate baby stunt. They Asda be joking. Posted on July 11th, 2013 in Food and Drink PR,Shopping Centre PR Stunts,Stunt Of The Day. Taking full advantage of the growing Royal baby frenzy, Asda came up with a regal gem of a stunt today. A dedicated HRH reserved car parking space has been created for the Duke and Duchess of Cambridge outside the Asda store in Llangefni, Anglesey. The usual parent and child pictogram has been provided with crowns – and a friendly Beefeater was provided to guard over it. Kate has already been a customer at this particular supermarket – which is down the road from where the young Cambridges’ have a home. So perhaps it isn’t that far fetched to imagine her doing a late night dash for some fresh nappies, wipes and talcum powder. According to the Metro, an Asda spokeswoman said the store wanted to ‘do something a bit different and special’ to celebrate the new royal arrival. “It’s created a lot of excitement among our customers who, like us, are looking forward to the birth of the royal baby,” she gushed. Before any republicans/Guardian readers get too hot under the collar, store manager Peter Ellis has promised that while Kate is busy elsewhere – launching ships, attending tennis finals etc – other customers “that fancy their own bit of royal treatment can park their carriages there”. Also spotted in the Telegraph, The Express and Mirror. Posted on May 23rd, 2011 in Fashion PR,PR Stunts,Publicity Stunts,Retail PR,Shopping Centre PR Stunts. LONDON, Monday 23rd May 2011: A group of stunning models unveiled Sainsbury’s new TU swimwear collection and turned commuters’ heads when they strutted across Westminster Bridge. Taylor Herring were briefed to showcase the range ahead of a new advertising campaign which premieres on TV this month. As part of the supermarket’s expansion of its clothing offer, the multi-million pound womenswear campaign, featuring beachwear and dresses, is the biggest ever for TU and is supported by print and online advertising. PR coverage include Daily Mail, Daily Mirror, Metro, Evening Standard and Daily Record and numerous online outlets.